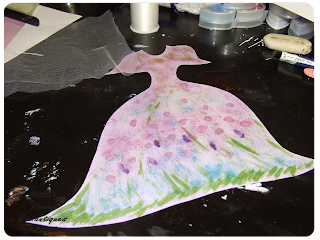 I am so happy to be able to participate in this year's Paper Dresses being hosted by Angela at Sew Loquacious. Angela added her own twist to this year's challenge by giving each month a different art theme. 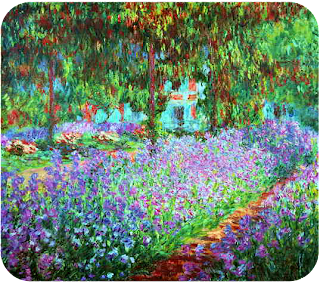 This month's theme is Impressionist art. 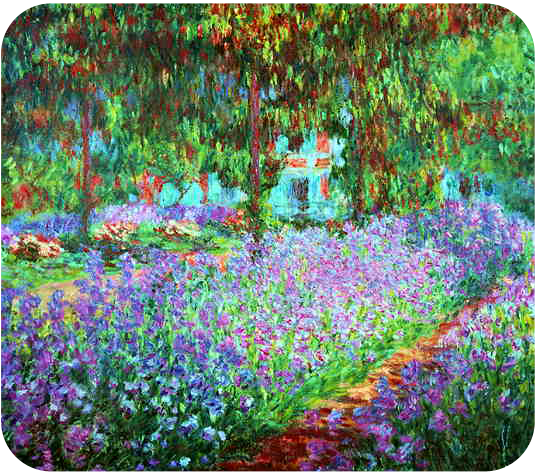 I chose Claude Monet's The Artist's Garden at Giverny as my inspiration. I so adore this painting. I love all the different colors and hues. So here are pictures of my first Paper Dress creation. I hope you enjoy it. 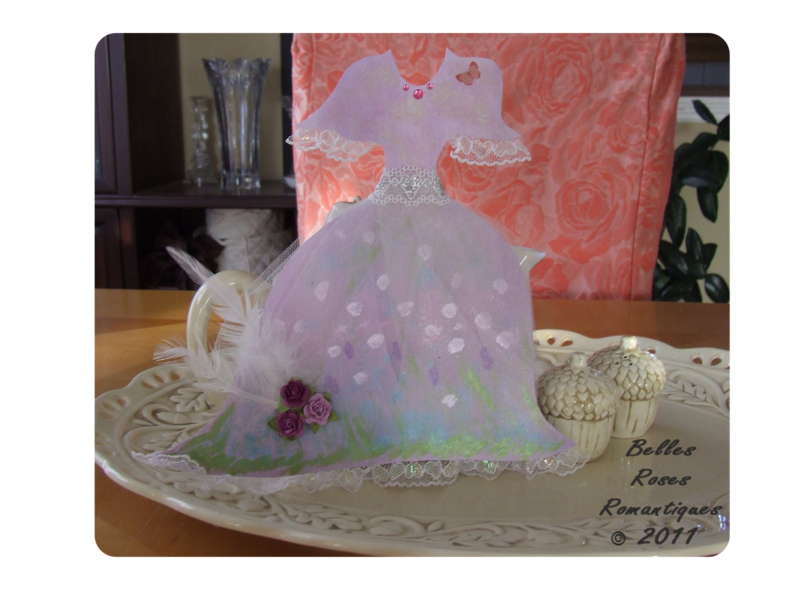 I started by making my template and I envisioned a beautiful Cinderella style dress. 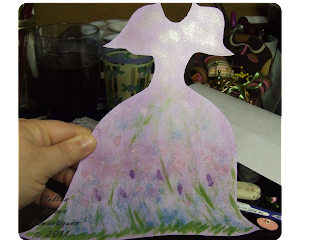 I used a lavender paper and then painted it with greens (to depict the stems), blues, pinks, purple, and a metallic beige. I worked at it at night, so the pictures didn't turn out to well. Lighting at my house is challenging. I have two daylight lamps on my "wishlist" which I hope to get soon. I kind of felt like it looked like flowers, at least that was the feel I was going for. 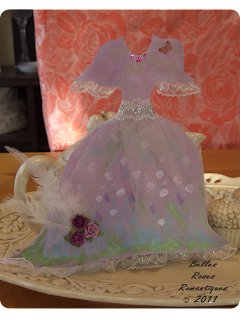 I then added, lace to the hem and sleeves, tulle to the skirt, lace to the waist, pink crystals to the neck, a pretty peach butterfly to the shoulder and lovely purple flowers and white feather to the skirt. 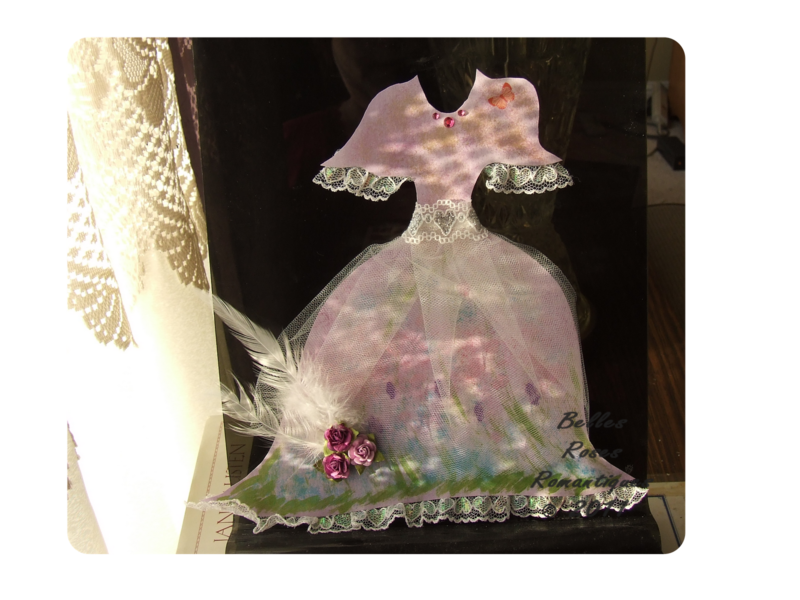 Don't forget to visit Angela to see all the pretty dresses. I'm going to have to work better next month on better pictures. I'm still learning this photography thing! oh how lovely this is.... I am new to this project so you inspire me for next month...thanks for visitng my blog.... please come back again the door is always open.. So pretty! I love your dress! I will give this a try in the future. What a lovely, sweeping dress! 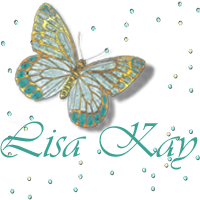 Love your inspiration, too! Your dress is amazing! You've done such a beautiful job! How you've used the painting for inspiration is spot on! I love the lace; it totally looks like it is fit for Cindarella! This dress is GORGEOUS - I love it and all the special touches you added are incredible. Yes, I love your inspiration painting, can you imagine how wonderful it must have been with all the sweet aromas of those flowers? Beautiful work. How absolutely fitting to the impressionism theme. 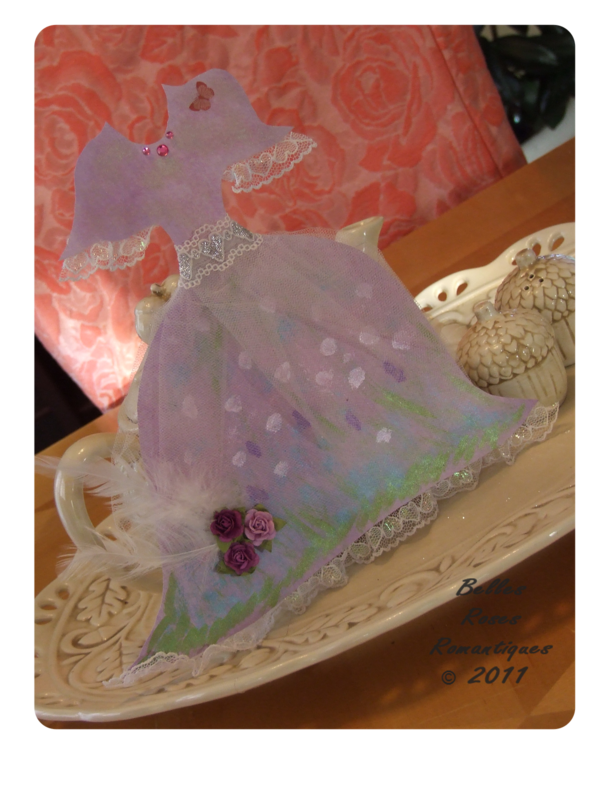 Your dresss has a wonderfully etheral feel with the floral painting, the gauzy skirt and feather. Wonderful!